The superscription of the second book of the so-called Minor Prophets names as the author of the book "Joel, the son of Pethuel." Further historical record is wanting. It is even impossible to get an idea of the prophet's personality from the contents of his book, because, in correspondence with its partly oratorical, partly visionary style, all personal traits have been omitted. Only this can be concluded from his writing, that he was a Judean and that at the time of his prophetical activity he lived in Jerusalem. On the other hand, imaginative suppositions try to prove from passages like Joel i. 9, 13; ii. 17 that he belonged to the tribe of Levi. The name "Joel" was quite common, being borne by the first-born son of Samuel (I Sam. viii. 2), and by prominent Levites of the time of David (I Chron. vi. 18 et seq.) and of Hezekiah (II Chron. xxix. 12). "Joel" means "Yhwh is God" (comp. Ps. l. 1; Jer. xxii. 24); it is, therefore, the transposed form of . In the face of this clearly recognizable and wholly appropriate meaning of the name, it is not necessary to suppose (with Baudissin) that it is the jussive of (= "may He [i.e., God] prove"); nor (with Nestle) that it is the participle of , which, corresponding to the proper names or (Arabic, "wa'il") occurring often in the Sinaitic inscriptions, is supposed to mean "strong-willed." The fact that is found also as a Phenician proper name (see "C. I. S." 132), proves nothing against the most natural interpretation of the name. What non-Biblical sources tell of the prophet belongs to the realm of fable. According to pseudo-Epiphanius (ii. 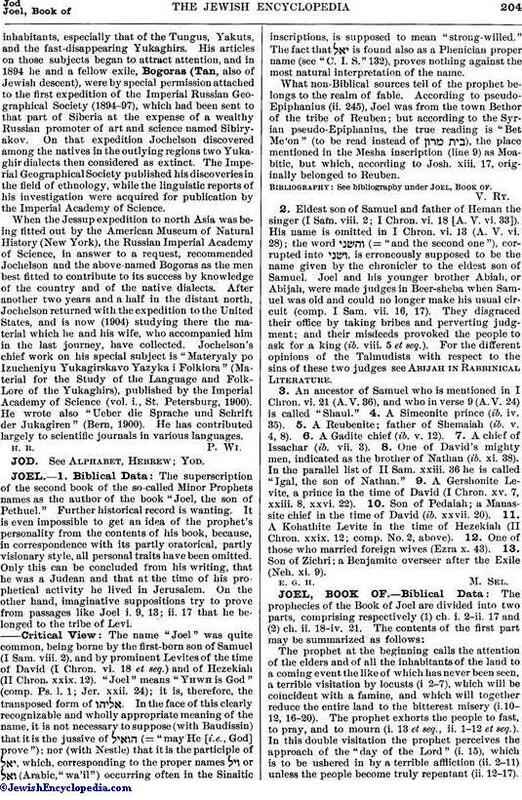 245), Joel was from the town Bethor of the tribe of Reuben; but according to the Syrian pseudo-Epiphanius, the true reading is "Bet Me'on" (to be read instead of ), the place mentioned in the Mesha inscription (line 9) as Moabitic, but which, according to Josh. xiii. 17, originally belonged to Reuben. See bibliography under Joel, Book of. 2. Eldest son of Samuel and father of Heman the singer (I Sam. viii. 2; I Chron. vi. 18 [A. V. vi. 33]). His name is omitted in I Chron. vi. 13 (A. V. vi. 28); the word (= "and the second one"), corrupted into , is erroneously supposed to be the name given by the chronicler to the eldest son of Samuel. Joel and his younger brother Abiah, or Abijah, were made judges in Beer-sheba when Samuel was old and could no longer make his usual circuit (comp. I Sam. vii. 16, 17). They disgraced their office by taking bribes and perverting judgment; and their misdeeds provoked the people to ask for a king (ib. viii. 5 et seq.). For the different opinions of the Talmudists with respect to the sins of these two judges see Abijah in Rabbinical Literature. 3. An ancestor of Samuel who is mentioned in I Chron. vi. 21 (A. V. 36), and who in verse 9 (A. V. 24) is called "Shaul." 4. A Simeonite prince (ib. iv. 35). 5. A Reubenite; father of Shemaiah (ib. v. 4, 8). 6. A Gadite chief (ib. v. 12). 7. A chief of Issachar (ib. vii. 3). 8. One of David's mighty men, indicated as the brother of Nathan (ib. xi. 38). In the parallel list of II Sam. xxiii. 36 he is called "Igal, the son of Nathan." 9. A Gershonite Levite, a prince in the time of David (I Chron. xv. 7, xxiii. 8, xxvi. 22). 10. Son of Pedaiah; a Manassite chief in the time of David (ib. xxvii. 20). 11. A Kohathite Levite in the time of Hezekiah (II Chron. xxix. 12; comp. No. 2, above). 12. One of those who married foreign wives (Ezra x. 43). 13. Son of Zichri; a Benjamite overseer after the Exile (Neh. xi. 9).